It all runs on the Linux system. The CPU used is Samsung with the ARM9 core and a clock rate of 400 MHz. Apart from 32 MB of the SDRAM memory and 2 MB of internal NOR flash memory there is also 384 MB of internal flash memory. The display with the E-Ink technology offers resolution of 600 x 800, it has a 5" diagonal and offers eight shades of gray. The SD slot supports the SDHC specification and it is able to read cards up to 16 GB (we have not tried bigger ones). The connection to the world is provided by a USB 2.0 port. 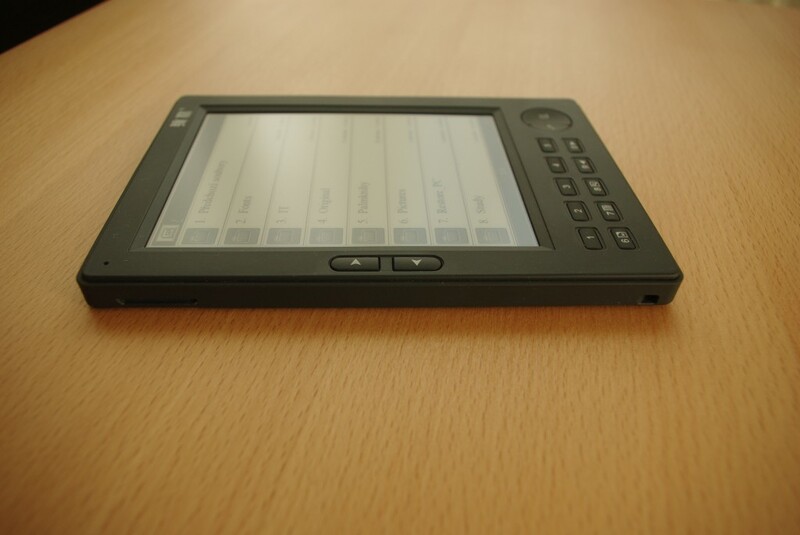 The dimensions of the device are 151.2 x 105.4 x 10 mm, the weight is 160 g.
The LiPol type accumulator can manage 1,000 mAh. The reader supports the following formats: PDF, DOC, RTF, HTML, TXT, MP3, WOL, CHM, RAR/ZIP, FB2, DjVu, ePub, BMP, JPG, TIF, PNG, GIF, PDB, PPT. That were the basic specifications and now for a small round trip around the surface of the device. Of course, the E-Link display dominates its front side. 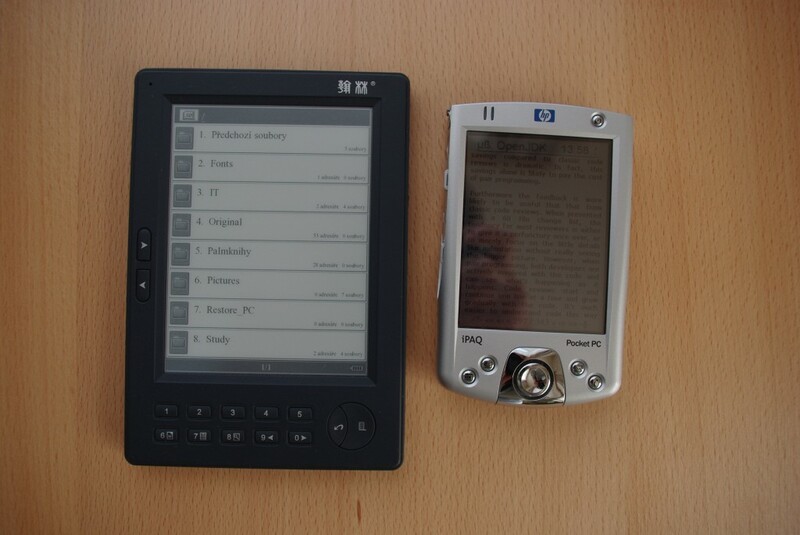 Although it is only a 5" version and not 6" like in the V3 model, it is still more than enough, especially if you are used to reading on your 3.5-4" PDA or - even worse - on your mobile phone. Left of the display there are buttons for scrolling pages or menus. "0" and "9" at the bottom have the same function (as you can see from the display, both keys could be used to scroll thanks to the fact that the display shows only 8 items - that means that keys 8 and 9 cannot be used for selecting). The broken arrow key is used for going back - both from actions and from menus. And finally the half moon on the right opens and closes the menu with options for text and the settings entry item. A detailed view of the control buttons reveals icons hidden under numbers 6, 7 and 8. The six serves for working with bookmarks (if automatic opening at the last know position is not enough for you). The seven will bring you back to the index (only in formats that support it - for example CHM) and the eight changes font sizes and also the display orientation. Font size can be changed in three steps for text + the rest (2 sizes + 1 maximal size even in the landscape mode) and in five steps for the PDF files (which can also be rotated). The port for headphones is a standard 3.5 mm port and it can be used with any headphones or speakers with the relevant jack plug. The small eye on the left is used for threading the hanger. On the right side there is a pressable jog-rocker that is used for going through the menu (apart from scrolling). It is an excellent feature and - by the way - a third possibility that can be used for scrolling. The upper part contains an On/Off switch that is more frequently used as a lock for the keyboard. Since E-Ink displays an active page permanently, it is not necessary to turn it off. 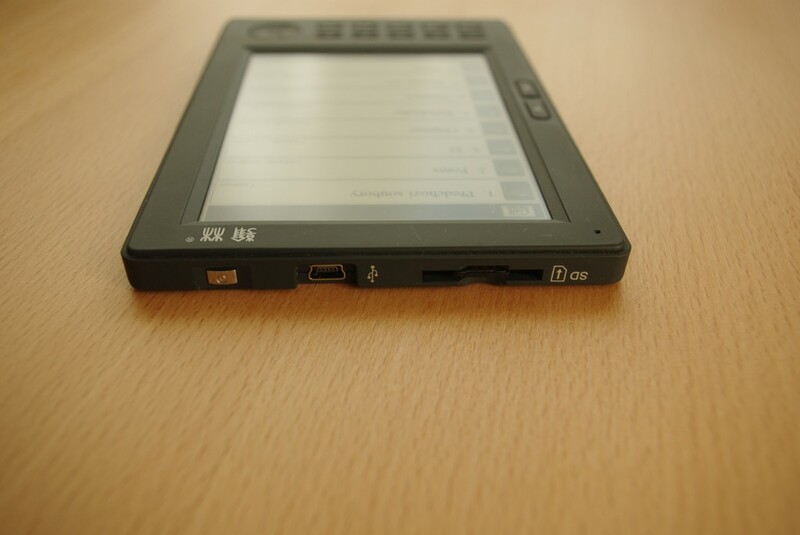 Right next to the On/Off button there is a miniUSB port that is also used to power the reader. Also, there is a SD slot. Apart from the hitch for the cover there is nothing on the left side. 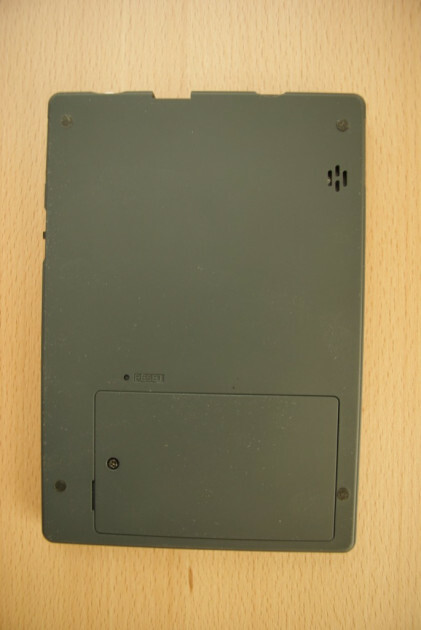 There is a flat cover that is hiding a biscuit-like LiPol accumulator and a PDA-like mini-reset on the back side of the device. 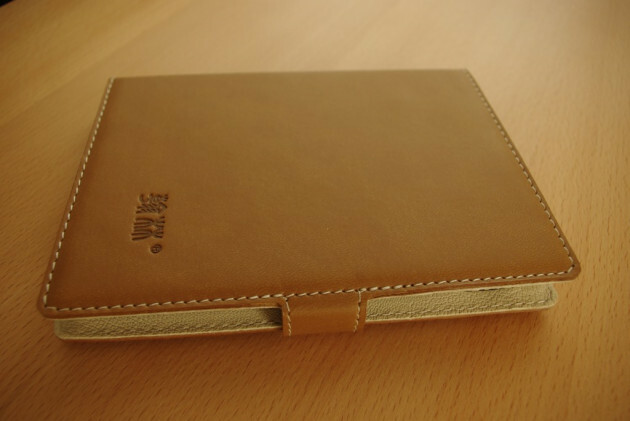 Hanlin V5 comes with this leather imitation case, which is equipped with a magnet to anchor the device more securely. 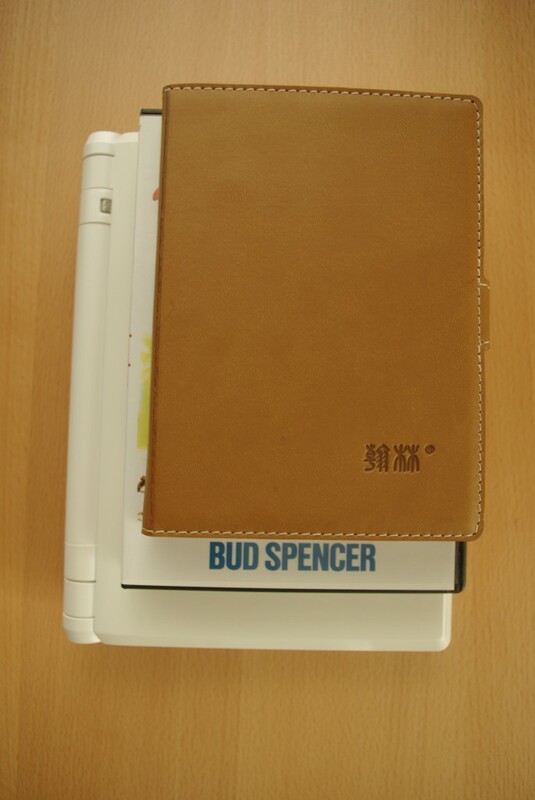 The case of the 5" version with Hanlin V5 inside is exactly the size that we would describe as "just right". One more centimeter and it would not fit into the jeans’ back pocket. Hanlin V5 in its case, under it there is a DVD box and at the very bottom the ASUS Eee. The same, this time in profile. 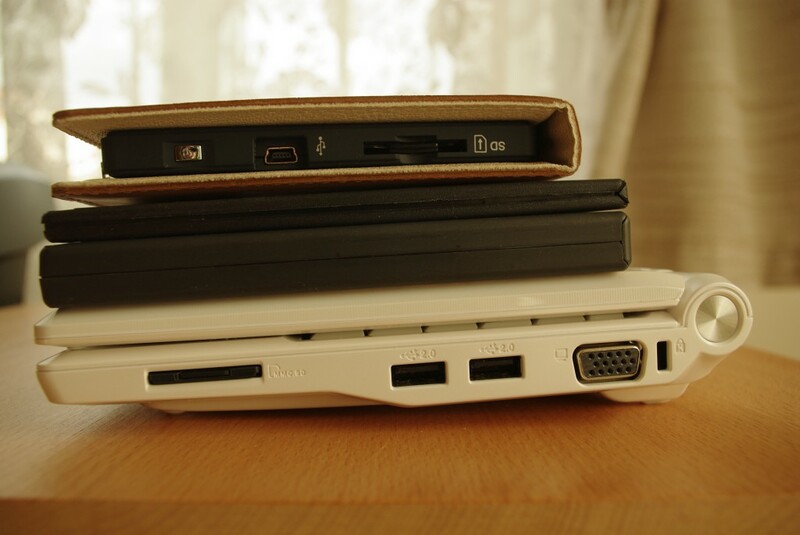 From the top: Hanlin, a small DVD case and the ASUS Eee at the bottom. If I should select a single area that Hanlin V5 excels in, it would be the amount of supplied accessories. Apart from the aforementioned leatherette case you get a USB/mini-USB cable, an adaptor with a USB output (which allows the reader to be charger from an ordinary wall socket), a Phillips screwdriver, two extra screws, a hanger and earbuds headphones. 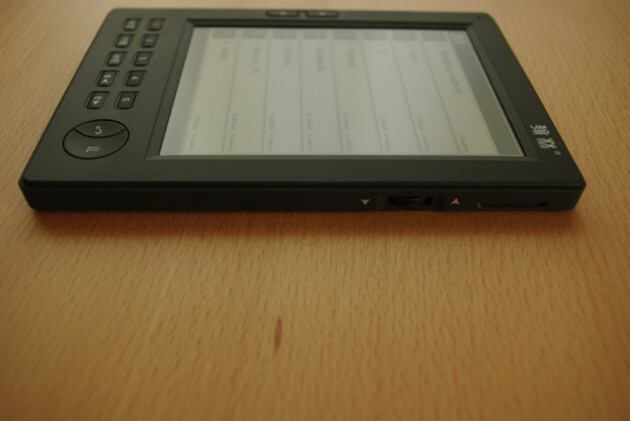 An behold, a hotshot for the Czech customers only: While the foreign V5 owners get nothing, for his or her c. 6.000 CZK the Czech customer gets a 2 GB SD card containing 250 Czech (and Slovak) e-books along with the device. George Orwell and his excellent 1984, Arthur Conan Doyle and his detective stories, Alexander Dumas and his Musketeers and The Count of Monte Christo, not to mentions dozens of books by Jules Verne. After a longer use, the subjective impressions about the display are very contradictory - in the direct sun and under a lamp it offers perfect contrast, however indoors and in a shade it is no great shakes. It reminded us of a gray output from a thermoprinter on a thermo-paper. Mind the fact that the display is not black but dark gray. One way or the other - in the sun, it reads perfectly. One must only get used to the fact that when turning pages, the E-Ink readers switch to the negative for an instant, which is done so that there are no artifacts from the last page in the new sheet. We will go through the remaining functions only briefly. Images in many different formats can be displayed (eight shades of gray is not much, but it is enough to view maps for example). Hanlin V5 is also able to open MP3 files (there are some e-books that are in this format, surprisingly it can be used to play music files as well), it supports subfolders and going to the first/last/given page. Of course it is possible to change fonts (only for the system menu, in the text only the font size can be modified). There are 8 basic fonts. The "PDF speaking" function available for the PDF files requires headphones and English text, otherwise it is completely useless. 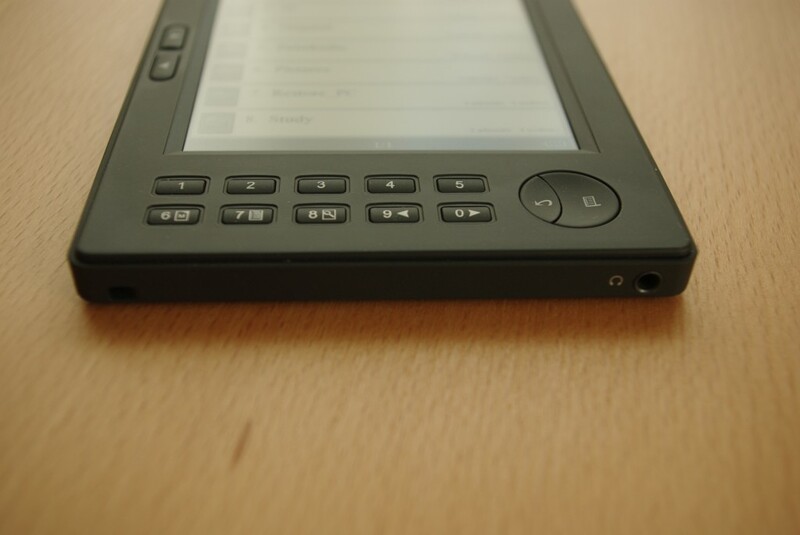 We also have some reservations against the firmware - sometimes the V5 freezes completely, which can be resolved only using the reset, sometimes it also deletes the pages that have already been read (the previous pages are blank). Although the program is familiar with the RAR files, it seems to be able to work with them only until a certain version. It could not work with the newest WinRAR output, in that case it crashed completely. The ZIP files were without problems. After you connect the cable to your PC, the reader will ask if you want to activate the connection. If you confirm, both units will connect as standard flash disc, which they are for that matter. That means that Hanlin V5 can be used as a SD card reader as well. The reputed accumulator endurance is eight thousand page turns for one charge.